I hope everyone had a lovely Christmas! 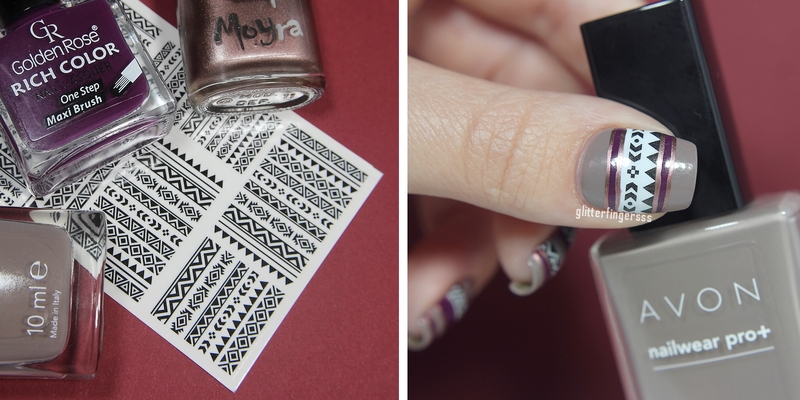 In today's post I'm going to show you what nail art I wore for Christmas. I did this manicure on 24th afternoon, and I left it on my nails for 4 days (which is kind of a record for me :D), I only removed it yesterday evening. Today I'm going to show you a really easy but lovely nail art, I wear this for 2 days now and I'm still don't want to remove it, I think I will leave it until Christmas. But don't worry, I'm going to show you my Christmas Eve nail art too this week, but that's going to be the last post for the week. I had this gorgeous polish - with an unpronounceable name :D - on my wishlist for a while, and now I finally could buy it. To be honest I can only repeat myself, because this polish is a standard A-England: interesting colour with an amazing formula. Today I will show you a Winter/Christmas themed stamping plate that I got from Born Pretty Store for review. I didn't choosed this, they kindly sent it as an extra, and even though I tried to avoid stamping lately (I want to focus more on my freehand skills), I was really happy when I saw it, because (oddly) I don't have any Winter/Christams themed stamping plates. ILNP is one of my favorite brands, I think Barbra makes some really revolutionary finishes, but keeps everything brilliantly sophisticated. It's a bit hard for me to go into the Winter season, because I love Fall so much. And honestly there's not too much of options in the Winter theme: I don't like to paint Santa, Snowman and that kind of stuff, so theres only a couple of patterns that I can choose from. Also, getting around Christmas I feel this need that I HAVE TO use red in my nail arts, and that is something that I try to avoid (can you tell that I'm not a red wearer? :D). Before I would show you my picks of the ILNP Winter collection, I will show you 4 nail polishes that I picked up a couple of weeks ago. They were on my wishlist for a while, and now I finally could buy them. I'm so happy that I finally could get Coral Reef from FUN Lacquer's 2nd Anniversary collection. I fell in love the minute I saw this beauty, and mostly because it's unique finish (holo glitters + shifting flakies) and awesome colour-combo. I'm going to show you 2 nail art that I made using Cirque Colors nail polishes. They are quite simple designs (well, compared what I usually do), because it's a lot harder working with quick drying nail polishes instead of acrylic paint. Annie from Cirque Colors was kind enough to send me 6 creme shades along with the Holiday collection, and since I never tried any Cirque cremes I was pretty excited what this brand can offer in terms of creme fomula. Today I have the pleasure to show you the Holiday Magic collection from Cupcake Polish. The collection will be available at cupcakepolish.com on December 1st 8PM CST. Today I'm going to review a peel-off basecoat from Born Pretty Store. I'm using it almost every day for over 6 weeks now, so it had plenty of time to show it's benefits and downsides. I'm about to show you the 6 new jellies/crellies that are going to be available for pre-order on November 23 from 12PM-8PM MST on llarowe.com and they will be $6 each. 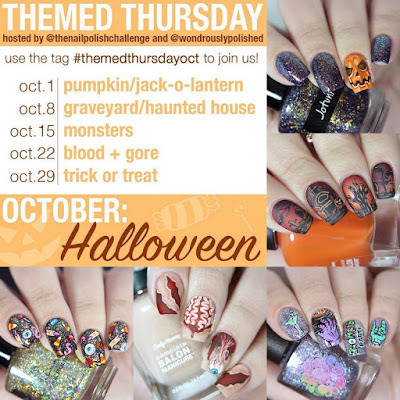 Most of the polishes are leaning toward the jelly category, so you either will need 3 coats, or you can use them for glitter/UCC sandwich or a pond manicure. Today I have 2 new A-England nail polishes to show you, both of them was kindly sent to me by Nailland.hu for review (Thank you Nailland ^^). Spirit of the Moors is from the To Emily Bronte collection, and Whispering Waves is one of the newest addition to the Heavenly Quotes collection. I have the Cirque Colors Holiday 2015 collection to show you today, which was kindly sent to me for a review, thank you Annie :) The collection consists of 3 brand new shades, and a recurring shade: AU, which is a 23K gold leaf topper. And here it is another amazing Colors by Llarowe collection, with 12 new winter (and not so winter-y) shades. They turned out so pretty, it would be a pain to choose only one, as a favorite. There is something for everyone in this collection, it's really versatile. In my last Born Pretty Store review package there was a nail art brush that I choosed, because I wanted to try out a more professional, a little bit pricier brush. I always use cheap ebay ones, you know that 3 for $1 brushes like THIS os THIS (I usually trim them with a nail scissors), and I was doing fine with them, but I wanted to see how these fancy nail art brushes work, and are they better than the cheap ones. You probably all know that one of my fave pattern is rose pattern. I like to paint my roses different ways, so today's manicure has a vintage, peony vibe. I did some really similar roses this year's 31 day challenge, you can check them out HERE. 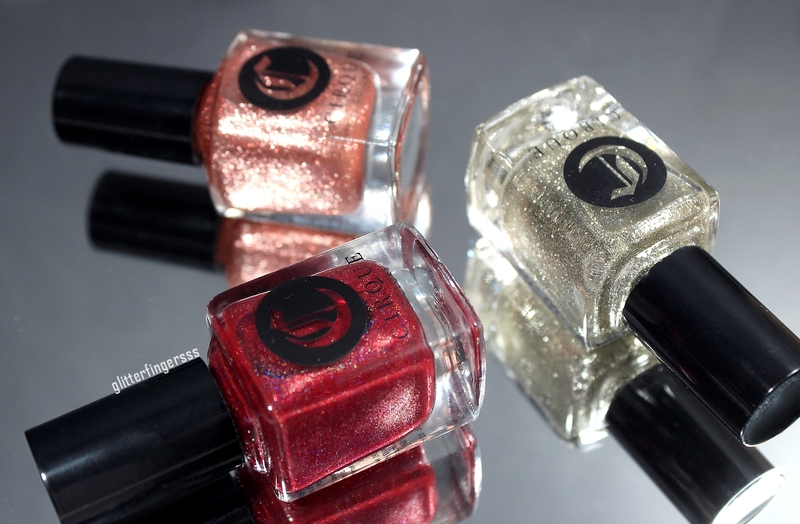 FUN Lacquer's Christmas collection is soooo beautiful! I really like the two green one, but the two Cheers to the Holidays are the stars of the collection in my opinion. I'm pretty sure that I'm going to buy the only duochrome version of this polish and Desires (H) too. 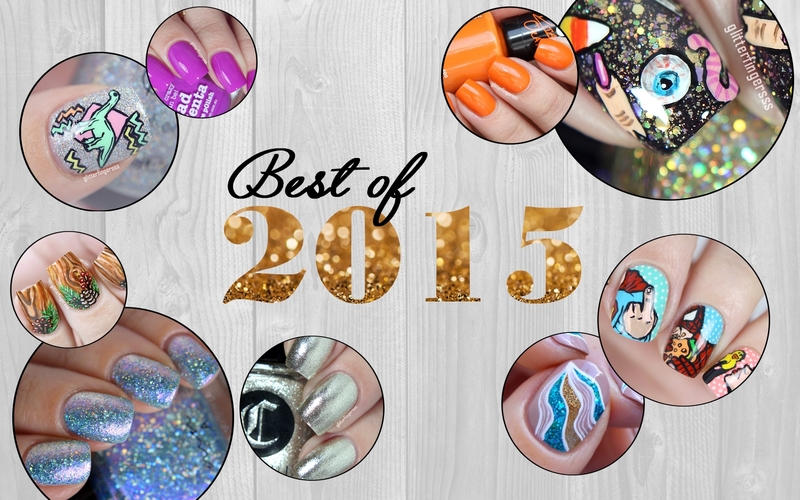 was real fun (you can see my nail art for the PP NAQ 1/2015 HERE), so I was really excited about it. I have these two PP's quite a while now, but I didn't had the time to swatch them. You may already have seen them in a nail art, because I used them (and Watermelon) in my PP Nail Art Quarterly mani. Now let's see how they look like on my nails. So, today you can see tribal half moons, alien and spacewalk, my first (kind of) pretty watermarble and my passion about weird greens. I bought these two KBShimmer flakies from Harlow&Co. a couple of months ago. and now let's see how they look on my nails! I heard only good things about the KBS flakies and their amazing coverage, but I was a little bit sceptical. Well I shouldn't be. These are truly amazing, both of them is a 2 coater! Are you ready for another set of 31DC? I hope you are, because I'm gonna show you my metalic, rainbow and gradient nails today. Btw. I will post these round-ups every monday and thursday, so now you know the schedule. I'm obsessed with Femme Fatale Cosmetics ever since I saw the first swatches of the Snow White collection. I think Femme Fatale makes the most unique, badass, edgy polishes nowadays. Their nail polishes are not pretty, the're not cute, but they are amazing and jaw dropping and I want them ALL! Here is the second pile of nail arts. 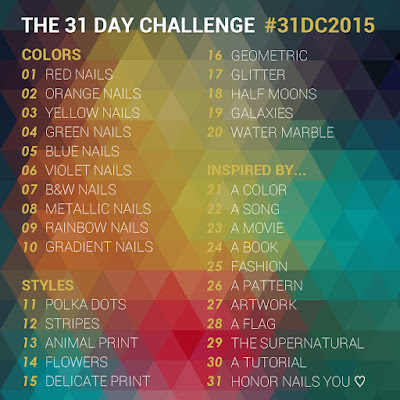 Today I will show you the green, blue, violet and black&white manis that I made for 31DC2015. Again, all of them is handpainted with acrylic paint. Today I will show you this bird/feather themed stamping plate from Born Pretty Store.